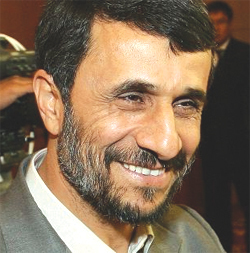 President Mahmoud Ahmadinejad: Hero or Villain? He has ruffled the feathers of the West. He is alleged to have called for Israel to be "wiped off the map." He received both condemnation and applause in the recent UN conference on racism. He says that "a number of powerful countries have been authorised to decide for other nations based on their own interests and discretion," thus he is out to “change the wrong direction in which the world is managed” and usher in an era where global decision making processes are participatory. Who is Mahmoud Ahmadinejad? What does he stand for? Does he hold any future for Africa? Could he be the leader the world needs most?